If you have already installed the NowSMS trial version, it is not necessary to re-install NowSMS in order to apply a purchased license to the product. However, it is possible to do this, and you may follow either the instructions in this section, or the instructions under the heading New Customer: Installing a Purchased License Version. When you purchase a NowSMS license, you will not be able to apply this license to the software until you receive both a Serial Number and Activation Code. 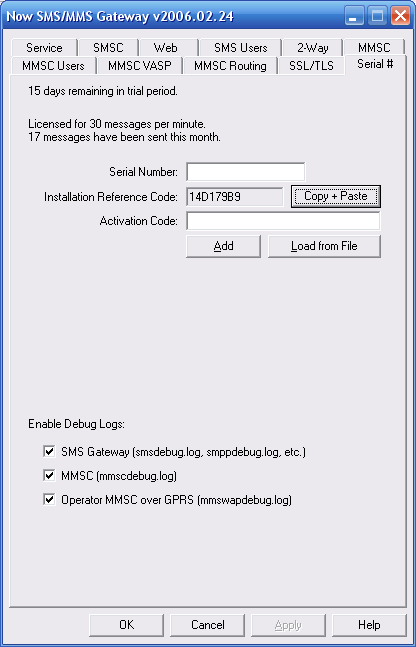 The Activation Code is specific to your NowSMS installation, and will not be delivered until you first send an Installation Reference Code that identifies your NowSMS installation to the publisher of the NowSMS software. The Activation Code is approximately 40 characters in length, and can be either entered manually, or more commonly, the publisher of the NowSMS software will send you a text file attachment in an e-mail message. Once you have received your Serial Number and Activation Code, these items can be manually entered in the Serial # page of the NowSMS configuration. As mentioned previously, the Activation Code is approximately 40 characters in length, which can be inconvenient for manual input. 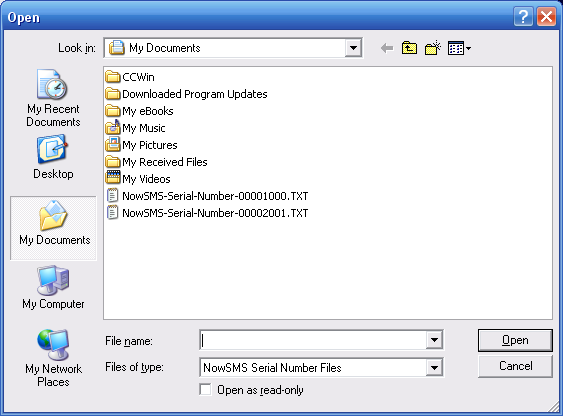 Normally, the publisher of the NowSMS software will send you a text file attachment in an e-mail message, which can be easily selected via the Load from File button. After opening the file, the serial number will be automatically installed to complete the product licensing.